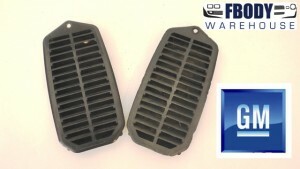 This is a pair of GM used door jamb vents which are used on all 1970 - 1981 Camaro and Firebird / Trans Am. Units are damage free and ready to install. Firebrid Trans Am and Camaro models. Units mount on the inner door jamb when you open the door. Good looking non restored GM units. Installs in minutes at home. SOLD AS A PAIR Left and right.